Nature, the sea and things to do in one of the most exciting destinations in the North of Sardinia: Palau. The countryside surrounding Palau is unique. 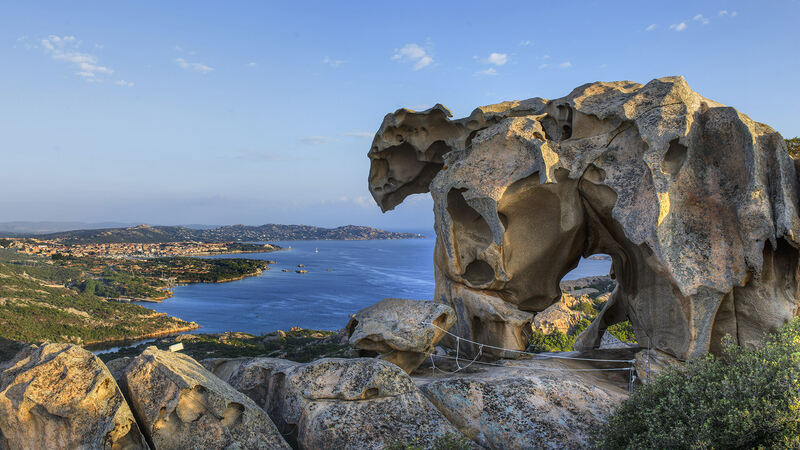 The town itself looks out over the islands of the La Maddalena Archipelago and the intense yet limpid blue waters wash over the area’s beautiful beaches, while moving away from the coast the luxuriant vegetation alternates with granite sculptures carved out over time and the hilltops provide views of rare beauty. They say that the name Palau derives from parago or parao, a term which the fishermen of the area used to define those points of the coast that were sheltered from the wind. It really does enjoy a privileged location, east of Punta Sardegna and close to the Mistral wind, halfway between the famous Costa Smeralda and Santa Teresa Gallura. A delightful walk along the waterfront leads to the town centre and the main square which is enlivened every summer evening by an eccentric street market featuring hand-crafted items and works of art. 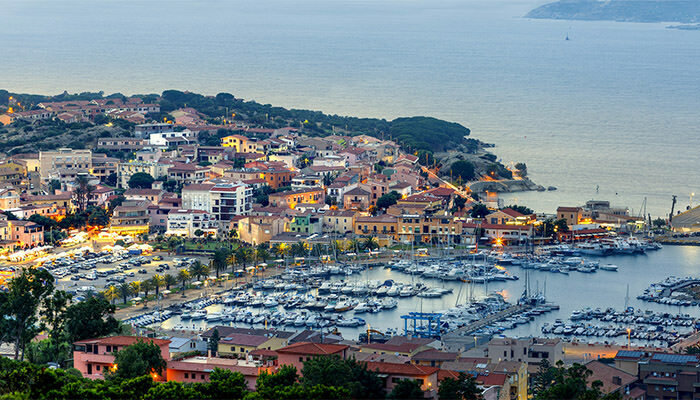 Restaurants, fast food outlets, shop windows showcasing Sardinian handicrafts, goldsmith’s shops and nightclubs alternate along the lively Via Nazionale that goes as far as the Palau marina. From here it is an easy 20 minutes by ferry to reach the Island of La Maddalena, itself connected by a bridge to the island of Caprera. This is a highly interesting excursion from a historical and naturalistic point of view with an obligatory stop for a swim at one of the Archipelago’s most beautiful beaches. And if the word holiday is also synonymous with discovery, it is possible to take a dive into the past by visiting the small ethnographic museum in Palau, a space in which exhibits and displays depict the agro-pastoral culture of the stazzo, the typical dwelling around which life in Gallura revolved between 1800 and 1900. From the promontory at Capo d’Orso as far as Porto Pozzo, the jagged coastline of the Northeast of Sardinia offers a number of beaches and bays of breathtaking beauty. Thanks to the excellent quality of the water and the swimming facilities available, over recent years some of the most beautiful beaches in and near Palau have obtained the prestigious Blue Flag award. 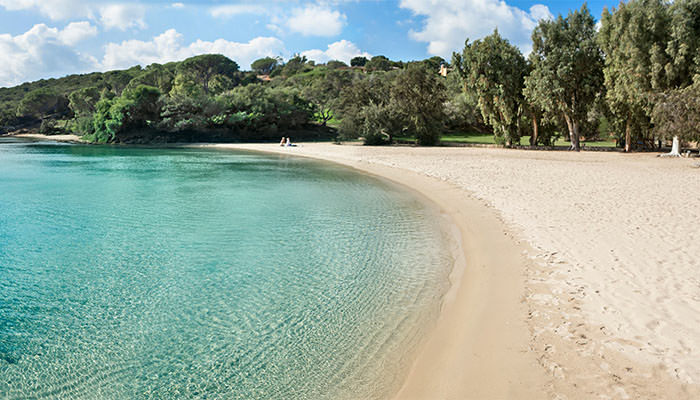 In 2017, the Isolotto and Stagno Saline beaches joined the list of earlier award-winners at Palau Vecchia in the heart of the town and the long sandy expanse of La Sciumara, Isuledda – Porto Pollo and Spiaggia Liscia, a stone’s throw from the Park Hotel Cala di Lepre. Close to the Delphina hotels in Palau, the beaches of Baia Saraceno, Punta Nera and Porto Faro are delightful little bays sheltered from the wind and perfect for spending hours enjoying the sun and the sea. At the foot of the suggestive Capo d’Orso promontory and surrounded by lush Mediterranean vegetation are the small coves of Punta Cardinalino and Cala Capra, the beach in front of the Hotel Capo d’Orso and the Residence Il Mirto. Continuing towards Punta Sardegna and Costa Serena, don’t miss the marvellous beaches of Cala di Trana, Punta Don Diego and Spiaggia di Talmone which you can get to along an easy and enjoyable footpath. If you are thinking of spending your holidays in Palau there are plenty of things not to be missed. The Roccia dell’Orso or Bear Rock is the symbol of this Gallura town, a massive boulder that has been sculpted and eroded over time by the wind to give it the shape of a bear. Since 1993 it has a Sardinia Region natural monument and sits at 122 metres above sea level on top of the promontory with which it shares its name. You arrive at the top via a pleasant walk and you will be entranced by the unique view of the nearby islands of the La Maddalena Archipelago. Descending the promontory towards the coast you arrive at the Capo d’Orso lighthouse which is set in a very suggestive wild location especially in the evening, when the panorama is lit by the rays of the sunset and echoes an ancient past. A few kms from Palau and north of Punta Sardinia, the picturesque village of Porto Rafael is another jewel not to be missed. Famous for its elegant chic style, the village is perfectly integrated into its natural surrounding and has a charming little port, shops and cobbled streets in Sardinian granite that reach the little square which is perfect for aperitifs! 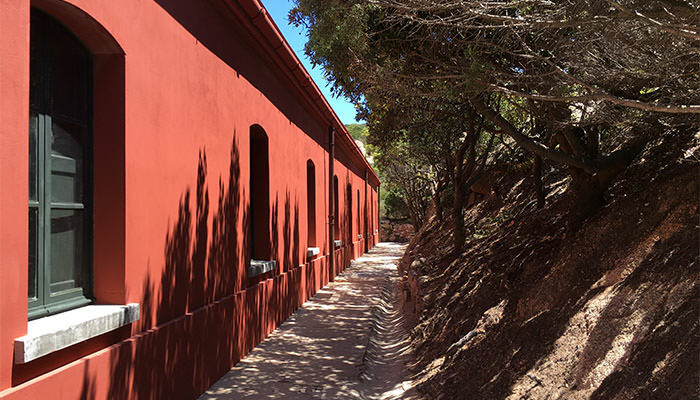 The road leading to Porto Rafael is dominated by the Monte Altura Fortress, a defensive building constructed at the end of the 19th century to protect the military base on La Maddalena and the entire Archipelago. It is an imposing granite structure and an example of architecture perfectly integrated into the landscape. Once past Porto Rafael and continuing towards the north west, you will reach Punta Don Diego and the Talmone Battery, one of the military fortifications built on the coast in the second half of the 18th century. After a little walking along the coastal paths you get to the building itself which was renovated in 2002 by the FAI. Palau offers plenty of opportunities for leisure and entertainment. The surrounding countryside, the paths between the rocks and the Mediterranean vegetation are always appreciated by nature and trekking enthusiasts and keen photographers will be able to find plenty of scenic spots from which to take fabulous photos such as the Barrage viewpoint from which you can enjoy a special view of the islands of the Archipelago. However if during your holidays the main idea is to have fun, lively Porto Pollo and the Isola dei Gabbiani with the coolest beaches in Northern Sardinia are the perfect place. Kiosks on the beach alternate with windsurfing and kitesurfing schools where specialized instructors provide personalized equipment and lessons. A long stretch of sand is full of life until sunset and often even livelier after dark with parties and music until the early hours. There is also no shortage of nightclubs in the centre of Palau; plenty of places where you can have a long aperitif or start the evening before heading for the nearby Costa Smeralda. One of Palau’s coolest spots is Upper which boasts a panoramic terrace overlooking the harbour and which offers aperitifs and sushi, DJs and live music every night.